(Phys.org) -- A team of researchers in the US has successfully encoded a 5.27 megabit book using DNA microchips, and they then read the book using DNA sequencing. Their experiments show that DNA could be used for long-term storage of digital information. DNA is made up of nucleotides, and in theory at least each nucleotide can be used to encode two bits of data. This means that the density is a massive 1 million gigabits per cubic millimeter, and only four grams of DNA could theoretically store all the digital data created annually. This is much denser than digital storage media such as flash drives, and more stable, since the DNA sequences could be read thousands of years after they were encoded. The experiments success lay in the strategy of encoding the data in short sequences of DNA rather than long ones, and this reduced the difficulty and cost of writing and reading the data. Dr Kosuri said the process was analogous to storing data on a hard drive, where data is written in small blocks called sectors. They first converted the book, program and images to HTML and then translated this into a sequence of 5.27 million 0s and 1s, and these 5.27 megabits were then sequenced into sections of nucleotides 96 bits long using one DNA nucleotide for one bit. The nucleotide bases A and C encoded for 0, while G and T encoded for 1. Each block also contained a 19 bit address to encode the blocks place in the overall sequence. Multiple copies of each block were synthesized to help in error correction. After the book and other information was encoded into the DNA, drops of DNA were attached to microarray chips for storage. The chips were kept at 4°C for three months and then dissolved and sequenced. Each copy of each block of nucleotides was sequenced up to 3,000 times so that a consensus could be reached. In this way they reduced the bit errors in the 5.27 megabits to just 10. The procedure, described in a paper in the journal Science, cannot be used for rewritable data but could be used for very long-term storage of data. One advantage of using DNA is that a much greater density of information can be stored, but another major advantage is that DNA is a biological molecule that will always be able to be read biologically without special equipment such as CD or DVD players that can quickly become obsolete. The main disadvantage of this system is that at the moment the technologies used to synthesize and sequence DNA are far too expensive for it to be a practical system for everyday use. Another problem is that while DNA has been sequenced from sources such as mummies thousands of years old, the DNA tends to be fragmented, and work needs to be done on improving the stability of DNA over centuries and longer. Digital information is accumulating at an astounding rate, straining our ability to store and archive it. DNA is among the most dense and stable information media known. The development of new technologies in both DNA synthesis and sequencing make DNA an increasingly feasible digital storage medium. Here, we develop a strategy to encode arbitrary digital information in DNA, write a 5.27-megabit book using DNA microchips, and read the book using next-generation DNA sequencing. Their experiments show that DNA could be used for long-term storage of digital information. Where are the evolutionists pointing out "mutation" issues? 10 bit errors in 5.27 megabits is actually pretty bad for just 3 months. A bit error in the right place in a markup language or a programming language could be impossible to recover. A bit error in a photograph or 3-d model is impossible to recover without another copy. Now you could do double or triple redundancy to make it easier to recover some bit errors, but at this rate you will have 8 bit errors per megabyte per year, so after an alleged century you're looking at 800 bit errors per megabyte. I figure you need at least 3 copies to ensure it's fully recoverable after one century, and probably 2 or 3 extra copies per extra century thereafter. 1, Contains a "Language A to Language B" dictionary for every language pair, or at least for every major language pair. At least catch the top 2 or 3 dialects for each major language. 2, Contains a dictionary and thesaurus for each language. 3, Contains example paragraphs for conversion of common usage and "figures of speech," which can be very hard to understand centuries or millennia after the fact. 4, Preserves what we know of each old or ancient version of each language as well as what we know of their translations. All of these things exist today, but I don't think they exist in single archive or translator tool, though improvements have been made in recent years with tools like google translate. "Where are the evolutionists pointing out "mutation" issues?" This wasn't designed to reside in a living being. The original template (once it has been finalised) would be kept, and can be stored in multiple ways. Besides, I'm sure we will come up with a way to 'fix' the DNA set in place. "One cosmic ray particle, EVER, and your data is destroyed..."
One power surge & your hard drive can be destroyed. Sectors die all the time even without that. Try storing data for 100yrs on them. How friendly would plasma be to electronics? "Each copy of each block of nucleotides was sequenced up to 3,000 times so that a consensus could be reached." Effectively, these are copies. Apart from that: this is only an initial experiment in a lab, to see if it can even be done! I could encode a book with rocks on the beach or salt granules on the table at Denny's... Granted DNA is more difficult to work with but the principle is nothing new. This means that the density is a massive 1 million gigabits per cubic millimeter. How the hell do you convert a program (or an image) to HTML? There are different encoding schemes ithat can guard against 'block' noise (i.e. if you expect bits in sequence will be detroyed - like if you transfer digital data during a thunderstorm). But with cosmic rays we're more likely talking stochastic noise to which the first scheme is appropriate. A bit error in the right place in a markup language or a programming language could be impossible to recover. Errors in markup languages are actually pretty easy to fix (as opposed to full binary data). Even if the tag is destroyed you can still save all the data in the other tags (unless the relational positioning of the tags is important - which isn't the case here). If it's only partially destroyed you can often infer what tag it was. Storing on DNA (in live cells) could have also the benefit that you could use common cellular mechanisms to continually repair DNA. At 12 petabytes per cubic millimeter you could store 10 (or 100 or 1000) copies of this data and read each copy simultaneously and assume the correct information is the one with the highest degree of concurrence and then simply correct the corrupted copies. Reminded me of an SF story by Chris Lawson called "Written in Blood". Here's a provoking though. If all DNA is so specific to each creatures and they can vibrate at very specific frequencies to the point of termination. Why don't we find out at what frequency the AIDS virus vibrates at and put that in a form of a frequency explosion and take the AIDS virus off this earth. Oh, could that work for let's say all white males. Or, all colds viruses, cockroaches, GMO Corn Plants, or what ever else you can think of. Why don't you help me on this. Can you think of anything around our life that needs elimination. CABAL's? Oh! I forgot to tell you. That's already invented. I can't take the credit for that ideas. Shucks I could of won the Nobel prize for Peace. Hey, can you keep it a secret that this is already invented. I'll patent it and then collect my prize after using on the white male banksters. The Peace Prize of Course. 1) What are you smoking? 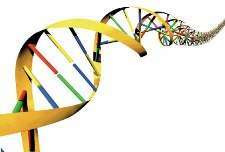 Since when does DNA vibrate at a certain frequency? DNA is all curled up in a bunch. It's not stretched out in a string that will vibrate. 2) Even if it DID vibrate. The whole reason the HI-virus is so hard to kill is because when it repliccates it makes a lot of errors (i.e. it mutates very quickly). The DNA of no two HI-viruses is identical.